THE HOTTEST PEPPERS ON EARTH!!! 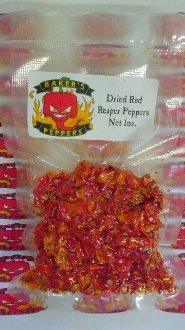 We now have The Red Reaper dried peppers available in these 1oz packs! These peppers are WHOLE peppers with stems removed!! These peppers weigh in at OVER 2.1+MILLION S.H.U.!! Very nice flavor along with SEARING heat! Order yours TODAY!! *Purchase/Consume at your own risk!